She's a childhood friend, but she goes away in the midst of the game and it's Link's job to search for her. This game's plot is something like a school drama, you could say. The flying sequence at the E3 demo is Link competing against his classmates. One of them looks kind of a like a bad guy, as you saw, and he shows up in other ways in the game too, since he has a major thing for Zelda. Check out the game's E3 trailer below and ruminate about Zelda's lack of royal connections in the comments further down. It's good to see Nintendo changing things up, maybe in the next Mario game Luigi can be a shark? That would be cool. I don't know why But I'm strangely OK with this. It was kinda expected for me since this is the prequel to Ocarina of Time. I wish that they would do a spin off series with the Sheik character from OoT. What Kaiser said. Still cool though. I might be imagining things, but it seems as if the design of Link's face (and eyes in particular) has been significantly improved as of E3; in the prior trailers, particularly GDC, I thought his eyes looked very dark and odd, and his expression un-Link-like. Now it looks perfectly normal. I'm still not a huge fan of Zelda's design, though, nor do I care for this villain. Hmmm, interesting. I suppose Zelda not wearing a crown hardly changes the story-line massively, although, it does upset the flow of the timeline. The creature @1:17 in the YouTube vid has GOT to be the coolest new character in the Zelda universe!!!!! "This game's plot is something like a school drama"
I demand twee, narmy pop songs throughout. Also a love triangle involving Zelda, Tingle and Link. @Bezerker, I thought you ment the snake! Lol I actually really liked it. Not diggin the "school drama" thing. I'm wayyyy too old to care about high school dances and puppy love. So, this is the story of the First Zelda. A school drama...I hope Aonuma wasn't being too literal. Still, non-princesses are people too, although I'm wary of both her and Link's character design. If it's the story of the first Zelda, I except her to sleep at the end of the game. THE LEGEND OF ZELDA. I actually like it. From the video it looks like a cross of Twilight Princess and Windwaker graphic wise. It doesnt look like South Park like everything did in Windwaker. Now if they did Windwaker to like this graphic wise I probably would have been able to play it. I cant wait for this one but first I need to play Twilight Princess. If Link is a teen in the skyward sword which is chronologically the first game in the series, then how is he just a young boy in other Zelda games like OOT, Majora's mask etc? It's not the same Link. @mariofanatic128: It's possible that Minish Cap takes place first, but no one really knows. Reoccurring characters like Link and Zelda are reincarnated in most of the games, so this isn't the same Link as the one in Ocarina of Time, Wind Waker, Twilight Princess, etc. It's similar to how the Doctor Who incarnations work. Basically, a new "Link" is born whenever Hyrule needs a hero to saves it's rear. Oh man! Skies of Arcadia: Zelda Edition! I can't wait!!! Maybe this game will explain how the Hyrulian monarchy was established. I don't know why everyone fusses about the new Zelda. The OT Zelda is fine, but I think changes now and then shouldn't be a mess. It's not the same Link and Zelda in every game (should be clear since WW, was in the games since Zelda II), so why should they always look the same? The new Zelda remembers me a bit of the ALttP Zelda. So does that mean Link will have to save Zelda by passing the 6 temples of classes? The Science Temple, The English Literature Temple, The Algebra Temple, The PE Temple, the History Temple and the Final Exam Temple! And then Ganondorf will be revealed to be the principal for no reason. I bet that Zelda is discovered to actually be a Princess before the game is over. @Sushi No, no, no. The love triangle will involve Zelda, Link, and the Skyward Sword girl. After they save Zelda, Link will realize the girl of his dreams was right in front of him all this time. Also after Zelda's rescue, instead of returning to Skyloft, the native Hylians make her their prom queen. It's interesting news, but it's not the first time they've had a "Zelda" that wasn't a princess. Tetra in "Wind Waker" was a pirate, though she WAS a descendent of the princess Zelda, so I guess technically she still had royal blood in her. Maybe near the end of the game, she will become royal. Even if Zelda's not a princess anymore, Skyward Sword will still be a great game. Nice to have this confirmed. I figured this already. I have a feeling this is going to cover the Hyrule Civil War mentioned in OoT.. I don't claim to be an expert/fanboy/whatever you want to call them but given what I've seen from the trailers, it seems to fit in with many things mentioned in OoT and TP. 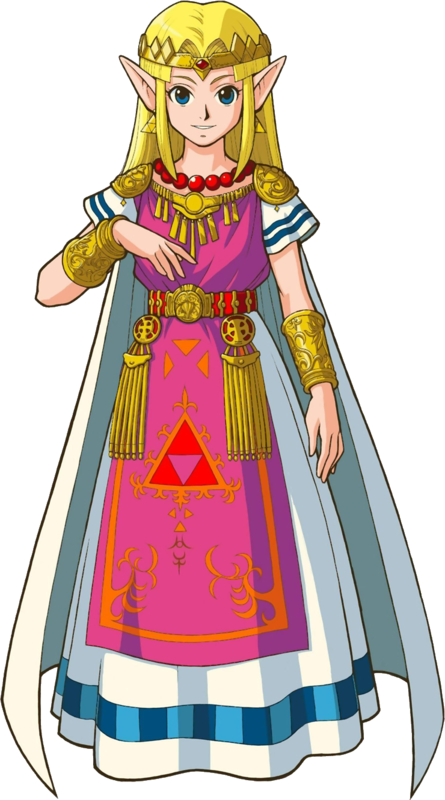 If the King of Hyrule hasn't unified Hyrule yet then how would Zelda be a princess? 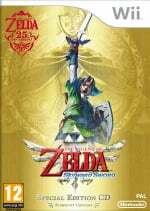 Looking forward to "Holiday Season 2011"
More like "Zelda is not yet royalty in skyward sword"
Is that the Wind Fish? I kinda figured this, honestly. Am I the only one who likes the new Zelda design? I don't like, however, how she's not the princess anymore. Kinda disrupts the storyline. When I first saw her in the E3 2011 trailer, I somehow knew that was Zelda. It must of been the looks or something. @MeloMan Let's hope it doesn't feel too much like Arcadia or Baten Kaitos, or else we'll all be wondering why Nintendo decided to give this game the Zelda name. The first Zelda in the timeline? Now where to put OoT since most people classify that as the starting point... back to the drawing board on that then. However, could this well be just a spin-off away from the timeline? @ 52 The only known split is the Wind Waker and Twilight Princess timelines thus far... I was hoping Aonuma was going to resolve that, but instead he introduced a prequel to what was supposed to be the prequel of all prequels, The Imprisoning War er, OoT. "a school drama" ?!?! was that translated correctly??? well she obviously was zelda.. did so many of you really not figure it out??? if anyone is still wondering you know what you are she does look like a princess no matter what they say she is.. and ofc.. she looks exactly like zelda from a link to the past anyway... only with less gold ofc.. damn that pic didn't seem so big on that page.. Classmate? NICE! It's time we should see some smootching between Link and Zelda? I mean, if I went throught 10 dungeons, collected various items and defeated alot of bosses, for my classmate sake, I would aleast expect a hug. Well, that's just me. I don't know about you guys. A friend gets lost? I could care less. That's how I feel in a video game and real life. Sadly, even though im an enormous fan of the series and even have the Sheikah eye symbol tattooed on my wrist to prove it, my excitement for this game has kind of evaporated. For one, its coming to a system that's pretty much dead and now the reveal of this teen-centric story arc has me rolling my eyes. I really hope they pull out some super amazing surprises to change my mind and make me NEED this new Zelda like I did every other game in the main series but as things stand now, I could just as easily skip it. Is it strange that I'm not really affected by this news at all? I like this new Zelda design. She's no longer just some emo woman who just looks at everything happening and is overshadowed by every other person in the universe: she's revitalizing her role that she took in the Minish Cap: a childhood friend that you truly feel attached to and is the reason for your adventure. This isn't a suprise for me either, I heard about the ' Zelda isn't a princess in this game' thing on Good Game. Bet she'll become royalty by the end of the game though. Zelda doesn't really need to be a priness. Heck, one time she was a pirate. They said they drew a lot of inspiration from Majora's Mask when developing the characters that interact with you in the sky city. GOOD. That makes me believe this will be far better than Twilight Princess. GOOD. I'm not reading the spoilers. All I have to say is that I've grown sick and tired of the same old same old Zelda story. It's about time they tried something different. In fact, I would totally be in favor of a Legends of Hyrule series, rather than the repetitive Legend of Zelda. That world has grown so much, there are better stories to be told than "Links saves Princess Zelda... again..."
So, no one else noticed that the villain-esque guy at the end of the trailer looks a LOT like Vaati? Good.It's nice to see change. I don't like the sound of School drama, but in the end I guess the story will click. One things for sure: It's good that Zelda doesn't start out as a princess. This story will tell how Zelda came to be in Hyrule. Something different for once! Well that is pretty cool! I think it's interesting that they're taking the story and setting in a unique direction. Twilight Princess was a fantastic game, but people rightfully complained that it didn't do enough to differentiate itself from Ocarina of Time. Skyward Sword seems like it will be the biggest departure from the Zelda norm yet, and personally, I'm all for it! It wouldn't surprise me if this tells why Zelda will always be the princess and Link will always be the hero. @xDemon720x: This doesn't really change anything, we still don't know if Skyward Sword takes place before or after Minish Cap. It's not going to shatter any timeline theories, either, because we already know it comes before OoT. @SilverBaretta: My first reaction was actually "Vaati's back!" At first I was disappointed to find out he's not Vaati, but after seeing the demo footage from this E3, I'm convinced that Ghirahim will be the best villain in the series. KaiserGX:"If it's the story of the first Zelda, I except her to sleep at the end of the game. THE LEGEND OF ZELDA." Exactly. B/c Zelda 2''s storyline explains this, unless Nintendo is retconning this portion of the story. However, just b/c it is known to be before OoT, doesn't mean it is the first in the chronology. Actually, if I recall correctly, in Zelda II, the Princess Zelda is put under a curse that was caused by her bratty brother. Feeling ashamed, he called for every newborn princess to be named "Zelda". "A long time ago the Prince of Hyrule had tried to obtain the Triforce, but Zelda refused to tell him the location of it. In order to extract the information from her, he brought in a Magician to interrogate her. Unable to find out any information, the wizard cast a sleeping spell on her, which also resulted in his own death. The prince, being unable to reverse the spell, had his sister placed in the castle tower, in the hope that she would one day be awakened. He decreed that all females born to the royal family from that point on would be named Zelda, in remembrance of this tragedy." In other news, we got motion controls, and now this story is probably going to be another thing people will whine about. Personally, I'm all for it, though it all comes down to how great the gameplay will be, which I know it will be! 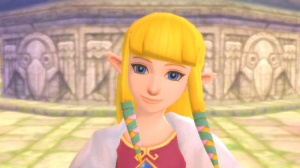 She's also no longer pretty, might be the first Zelda I'm not attracted to. Nice twist though, I like it. People, please realize that this is coming from the same company who purported in Super Mario Sunshine that Peach was Bowser Jr's mama! She so much better as a brunette, and those straight bangs aren't helping either. Is it just me, or is Links lips bigger than normal? >_> The "School drama" thing killed the buzz of me getting it.....I went through school drama more than once. I don't need it to be reflected in a game series I love. @88 - 0-0 What!! Peach = Bowser Jr's mother!! Where the hell have I been...oh right I didn't play Sunshine. I actually kind of like this new angle. Either way Zelda's design in this game would make me chase after her on a life threatening journey any day! mean come on, just look at that smile. A man with a life and job wont even discuss about this matter. Except: there are the funny Nintendo-noses again (looking at Zelda...). And Link still has a rat-face. This Zelda looks like a lot he NES´s Zelda. Wait that girl is ZELDA!? I thought it was Skyward Sword's equivalent to OoT's Saria and TP's Ilia (ie just a childhood friend, not Zelda herself). Well, the statement that it'll have school drama seems like an awful idea to me. We've seen that scenario HUNDREDS of times in games, movies, and books before. And yeah, the fact that Zelda is kidnaped is getting old for me too. Hope the story has more dramatic twists and such, kinda like how Twilight Princess's narrative was presented ('Tis why TP's story is my favorite out of the Zelda's even though it was, at its core, a very similar scenario to OoT). So she still has to get rescued? Not really breaking any ground here!